Undergoes temperature-controlled fermentation in large, old oak demi-muids as well as stainless steel vats. 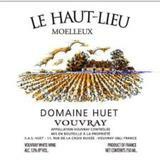 There is no encouragement of the malolactic fermentation, thus many Huet wines remain rich in malic acid, a character that brings an age-worthiness to the wines. Moelleux cuvees typically have more than 30 g/l residual sugar. Offers a big, broad feel, with layers of glazed pear, apple and peach falling over each other, backed by fresh ginger, honeysuckle and quince notes. Everything pulls together through the finish, with green tea accents and racy minerality providing the foil. Drink now through 2035.